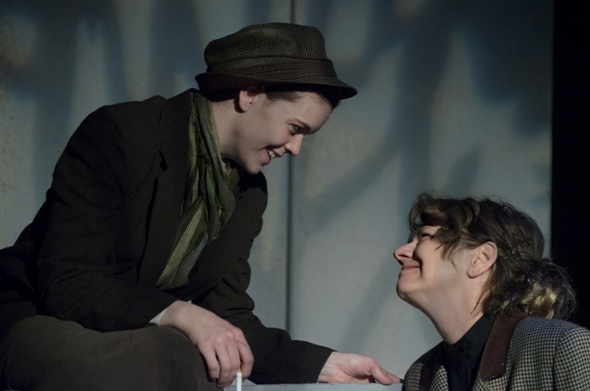 To list the intriguing features of Rebecca Lenkiewicz’s play “Her Naked Skin,” you could start with its title, then note that the story appears to be – but isn’t exactly — about the women’s suffrage movement in England circa 1913. Nor is it strictly a love story, though that forms (in more than one sense) its heart. What “Her Naked Skin” ultimately proves to be, and what makes Shattered Globe Theatre’s production a sleeper gem of the season, is the journey of one woman from the shadows and constraints of her conventional, secure world into the bright, life-altering light of self-awareness and self-realization. 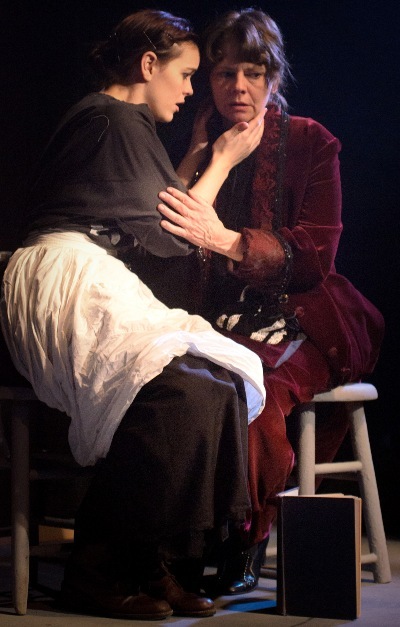 That migration fills the stage and commands our sympathies as the aristocratic Lady Celia Cain follows impulse as much as conviction down a path to she knows not where. She is indeed surprised at the challenging place where her fortunes land her, and so are we; and that’s the beauty of Lenkiewicz’s wise play as well as the appeal of this account directed with raw energy and edge by Roger Smart. 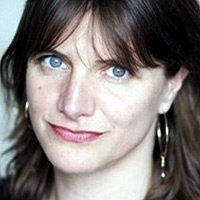 The 44-year-old British playwright, winner of several national awards for her work, became the first living female to have a play mounted on the Olivier Stage at London’s National Theatre when “Her Naked Skin” was produced there in 2008. Lenkiewicz has said she was inspired to write the play after reading Midge Mackenzie’s book “Shoulder to Shoulder,” about the British suffragettes, whose campaign for the vote lasted for generations, escalated into violence and saw activists jailed and severely abused before universal suffrage finally won out in 1928. “Her Naked Skin” is very much a war story. In the midst of the suffragettes’ increasingly militant campaign – advocates have begun smashing windows and setting fires to press their cause – the activist Lady Celia Cain (the genuinely patrician Linda Reiter) draws yet another sentence in a series of prison terms, typically four to eight months. But this time Celia, the mother of seven children whose marriage is severely strained by her advocacy, is incarcerated with a young seamstress called Eve (Sheila O’Connor) and swiftly succumbs to the girl’s fresh beauty. Thus begins a torrid lesbian affair that continues after both women are released from prison. Reiter’s worldly aristocrat, as emotionally vulnerable as she is intellectually imposing, and O’Connor’s lovely, earnest Eve make convincing lovers. And director Smart draws us into their intimacy by showing Celia to be absolutely smitten. That is critical to all the difficult events that follow. Their passion is cast against the warlike campaign for women’s right to vote and the violent reprisals on women who have been sent to prison. A historical tactic of the imprisoned suffragettes was to go on hunger strikes, which were met with brutal forced feedings depicted here with shuddering realism. 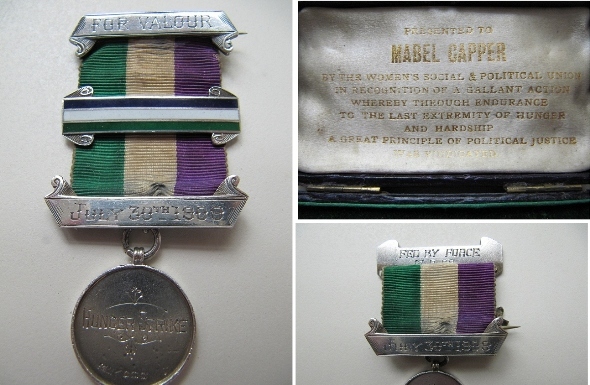 The play also shows us Parliament, where contemptuous men opposed to the women’s vote not only endorse the brutality but also insist that the suffragettes’ irrational behavior only illustrates the incompetence of women to play any role in governance. While she’s caught up in this heady whirl of revolution and romance, Celia is also struggling with a marriage on the rocks. She’s completely dependent on her rich but alcoholic husband William, brought to a fine pitch of noble torment in Tim Newell’s splendid performance. Celia has no evident way out, and though her husband defends her honor, he’s had quite enough of her revolutionary embarrassment. Eventually comes that day of cold light when Celia must assess her life – the suffrage movement, her affair, her marriage – and put it all in order. And when this intelligent and aspiring and caring woman Linda Reiter has formed before our eyes makes her hard choices, we believe them. We have not come to a happy-ever-after, but a turning point: Celia has many a challenging mile to go. “Her Naked Skin” presses a large cast of characters – jailers, doctors, MPs, demonstrators – into the small performing space at Stage 773. That compression intensifies the hurly-burly in the streets and brings us heart to heart with intimacy. Andrew Hildner’s multilevel set well serves both extremes, and Lindsay Schmeling’s period costumes — blooming undergarments everywhere — put a flavorful stamp on the scene. Not least, to each soul in this cross-section of life in time of foment, Shattered Globe’s company gives a distinctive face and bearing.